Trying to fix a bike can be a daunting task. After dealing with bolts, tubes, screws, tires, and wrenches it’s not unlikely that your attempt to change a chain has left you with 50 piled up parts. For those you who find yourselves as broken down as your bike when it comes to seemingly simple repairs, Jose Rivera‘s “Ice Cream Bike” offers a simplified construction that leaves repair roadblocks in the dust. 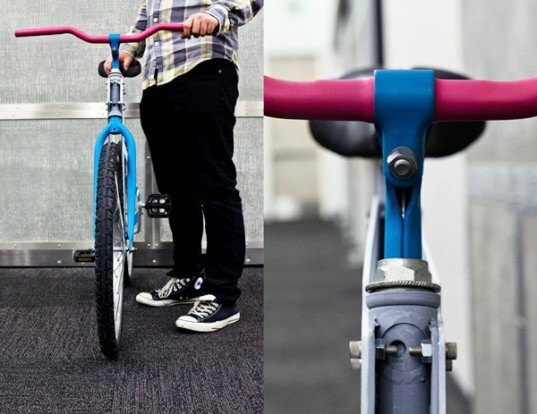 The Ice Cream Bike (which takes design cues from rainbow-colored ice cream) is made simply from salvaged parts and two pieces of recycled steel that were water-cut into the profile of a bike, and then bolted together at the front tube, seat tube and bottom bracket. The bike’s low-key construction requires only a screwdriver and a wrench when it come to maintenance. And because the bike can be easily broken down, it can just as easily be transported or stored. Trying to fix a bike can be a daunting task. After dealing with bolts, tubes, screws, tires, and wrenches it's not unlikely that your attempt to change a chain has left you with 50 piled up parts. 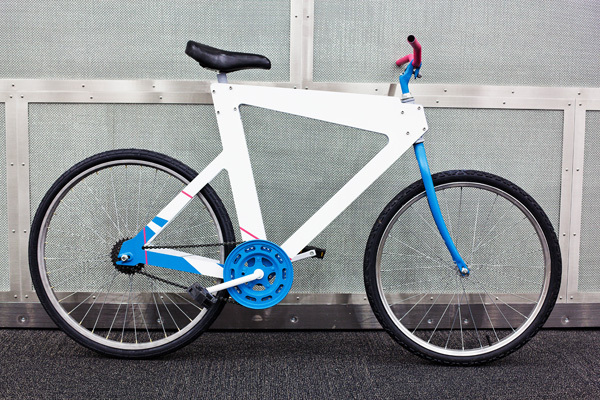 For those you who find yourselves as broken down as your bike when it comes to seemingly simple repairs, Jose Rivera's "Ice Cream Bike" offers a simplified construction that leaves repair roadblocks in the dust.